Description: With the implementation of the hearing aid dispensing program at Boston Children’s Hospital, they are providing monthly continued support outside of the clinical setting to families with deaf and hard of hearing children ages 0-3, as they navigate the hearing loss process. 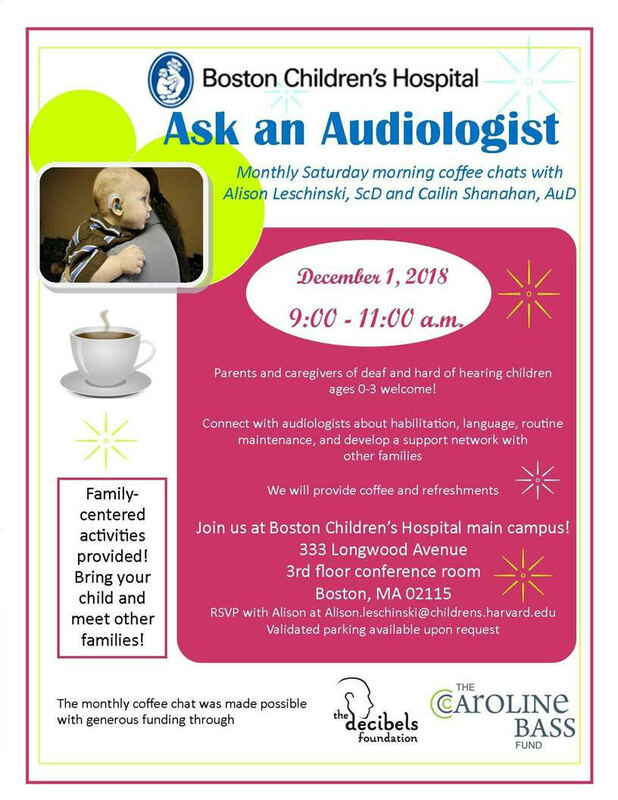 During the Saturday morning “coffee and chat,” Alison Leschinski, ScD and Cailin Shanahan, AuD will be available to connect with parents, caregivers and their child, and to help develop a network of support with other families. Please circle your calendar for December 1. Family-friendly activities will be provided so bring your child along! To RSVP or ask questions, contact Alison at alison.leschinski@childrens.harvard.edu.